Mumbai: Shares ended 0.8% lower in choppy trade on Wednesday as November inflation held stubbornly above 9%, disappointing investors, but growing hopes that the central bank could keep rates steady this week and likely adopt a more dovish tone amid slowing growth dabbed some cheer. "While this data disappointed, sentiment largely is still optimistic because weekly inflation data has been showing a downward trend and with overall growth slowing down, the market is expecting a pause on Friday," said Neeraj Dewan, director with Quantum Securities, a New Delhi-based brokerage. 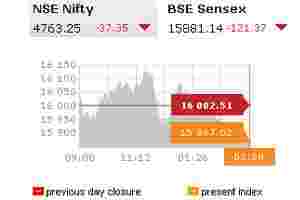 The 30-share BSE index closed down 121.37 points at 15,881.14, with 24 of its components closing in the red. It rose nearly 1% on Tuesday after losing nearly 6% over the three previous sessions. The outlook for the benchmark, which is one of the world’s worst performers this year having lost 22%, remains bearish. The benchmark index may decline to 13,500-12,200 points if it breaks its key support at 16,000, the risk for which has increased, Bank of America-Merrill Lynch said in a note. Earlier this week, October industrial output slumped 5.1%, the first drop in more than two years, building pressure on the RBI to ease monetary or liquidity conditions. Last week, the government sharply cut its economic growth forecast for the current fiscal year ending in March to between 7.25% and 7.75% from its original estimate of 9%. Foreign funds have been net sellers of more than $208.6 million of Indian shares this year, compared with record buying of more than $29 billion in 2010. Mortgage lender HDFC fell 2.5%, after dealers said the more-than-expected November inflation print will negate chances of a rate cut at Friday’s RBI review. Shares of export-driven drugmaker Sun Pharma ended up 1.7% after the rupee slumped to another record low versus the dollar for a third consecutive session. Capital goods maker Areva T&D fell 24% after its plan to separate transmission and distribution business took effect. Tata Teleservices Maharashtra gained 3% after The Times of India reported that Japanese telecom firm NTT Docomo is set to discuss an option of increasing its stake in parent Tata Teleservices to 35% in next four months. The 50-share NSE index ended down 0.78% at 4,763.25 points. In the broader market, losers led gainers 983 to 459 on a total volume of about 514.3 million shares. The euro hit 11-month lows and European stocks fell on Wednesday after the US Federal Reserve warned Europe’s unresolved sovereign debt crisis could hurt the US economy. The MSCI’s broadest index of Asia-Pacific shares outside Japan was down 0.6%.